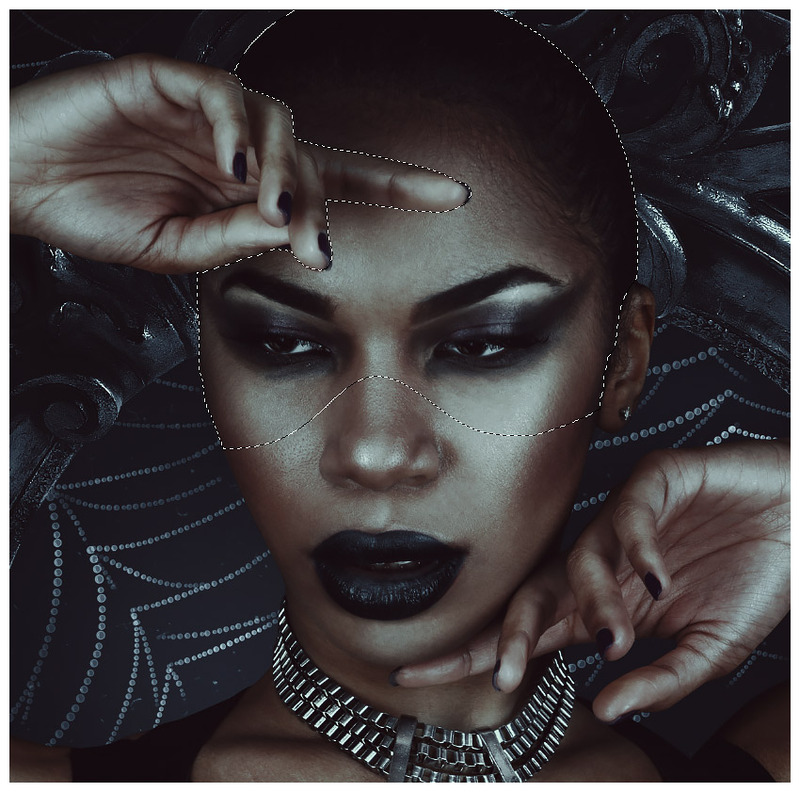 Today we will be exploring the darker side of fashionby creating a latex-clad spider woman! We will create our own spider-web brush using simpleshapes, create our own bead detailing from scratch, and use textures to add both depth and detail. Hopefully, you aren’tafraid of spiders because here we go! Find more high-quality resources onThemeKeeper Elements! To start, we will be creating a background for our subject. 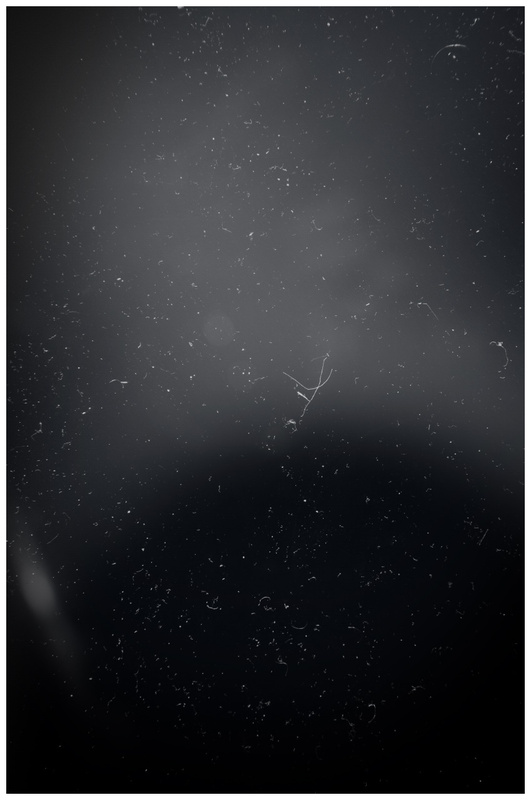 A dark and dusty environmentsounds fitting for a spider, don’t you think? 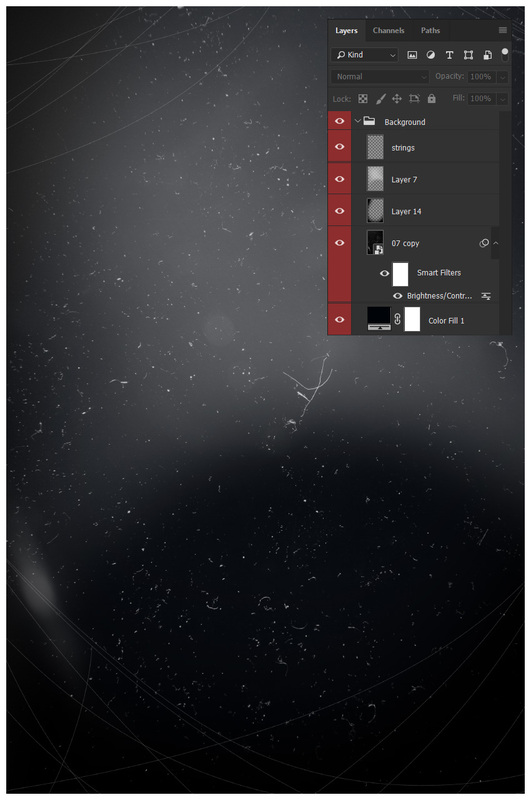 Let’s create a New 2287 x 3440 px Canvas. Create a Color Fill Layer and fill it with a very dark blue #000308. Place texture “07” from theDust and Hair Particlestexture pack so that it is flipped vertically and the exactsize of our canvas. 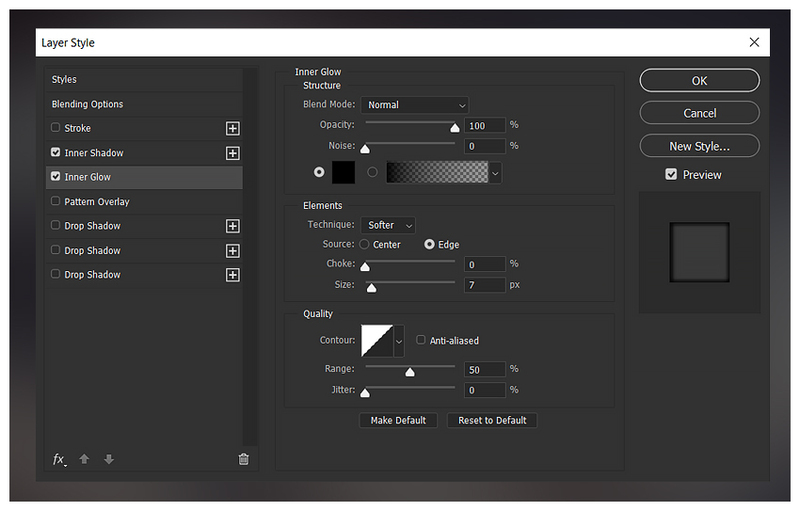 Set the texture toScreen with a73% Opacity. Create a New Layer and set it toOverlay. Using a very large, soft round Brush, paint black on both the bottom and the left side of the canvas. Create another New Layer and, with thesame brush as before, paint white on the middle and top portion of the canvas. To finish up the background, we are going to add some simplified spider webs. 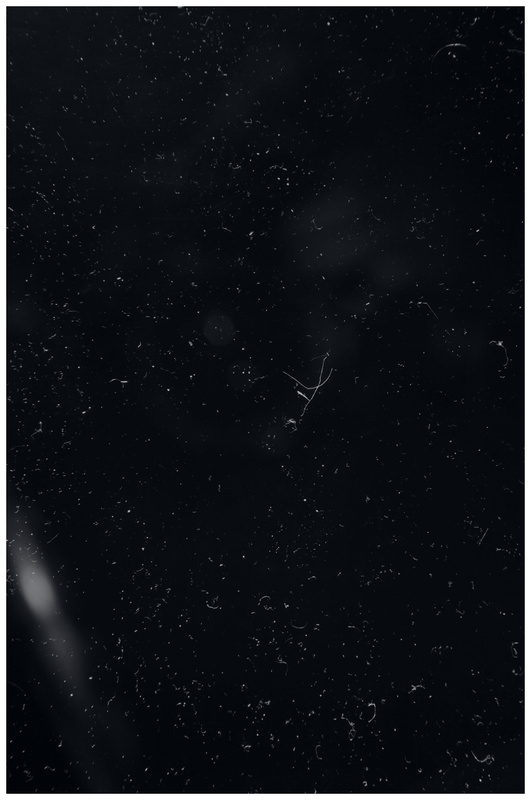 These aren’t our main spider webs, just some extrabackgrounddetail, so don’t overthink them! Using a hard 1-2 px Brush, paint white stringscoming from all four corners of the canvas, painting in a large “swooping” motion. Next up, we are going to place our subject in its newly created environment! First, we are going to extract our subject, which is ourWoman in Black Latex. As thesubject has no difficultcloth, clothing or hair to extract, feel free to use whichever method you prefer! I personally favor the Pen Tool. Resize and place the subject so that she is roughly in the same positionas you see below, directly in the middle of ourcanvas. 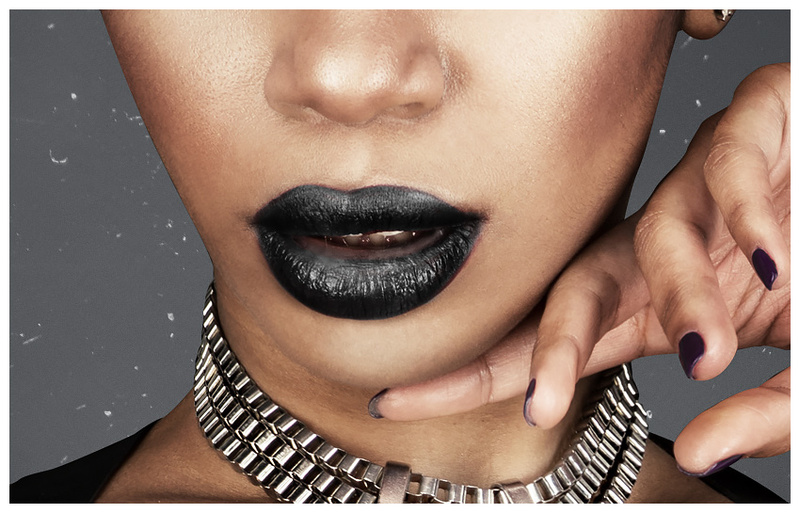 Now, we will be changing our subject’s lipstick to a dark black color. 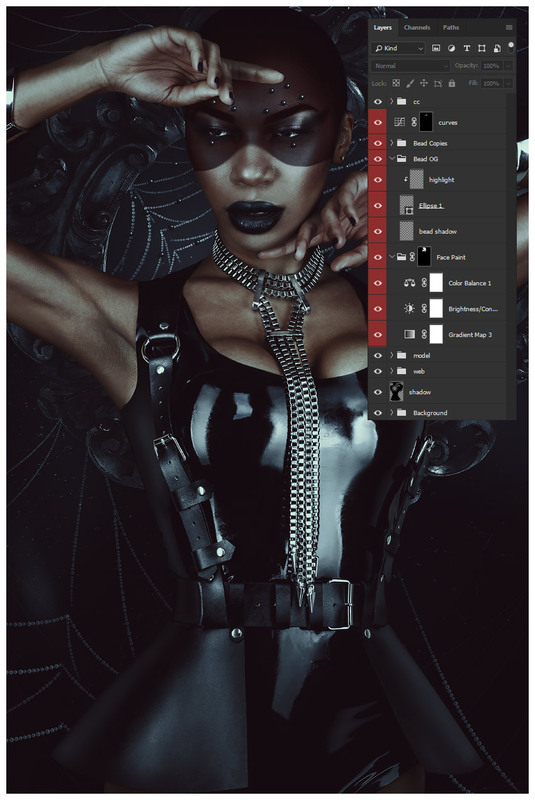 Create and clip a Black to White Gradient Map Layer into our subject. 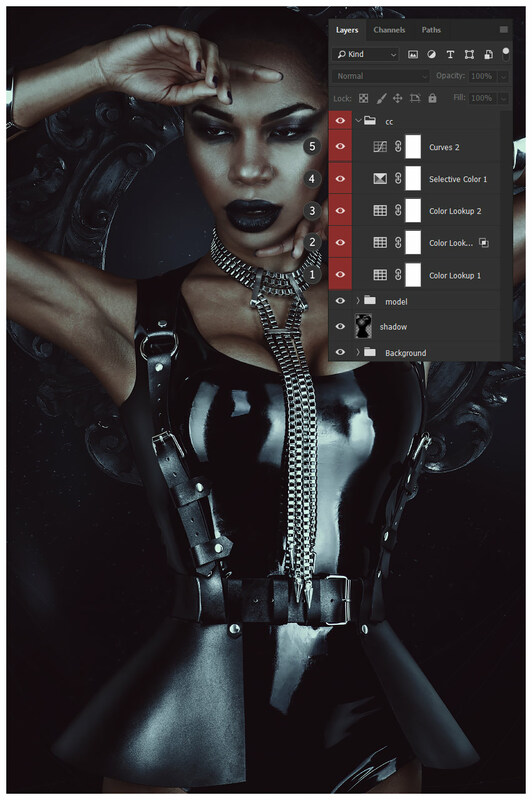 Click on the Layer Mask and hit Control-I to invert it, turning it black. Using a medium, hard round Brush, paint white over the top of the lips to mask back in the black and white gradient map. Create and clip a Brightness/Contrast Layer into the subject. Settings: Brightness -83 and Contrast23. 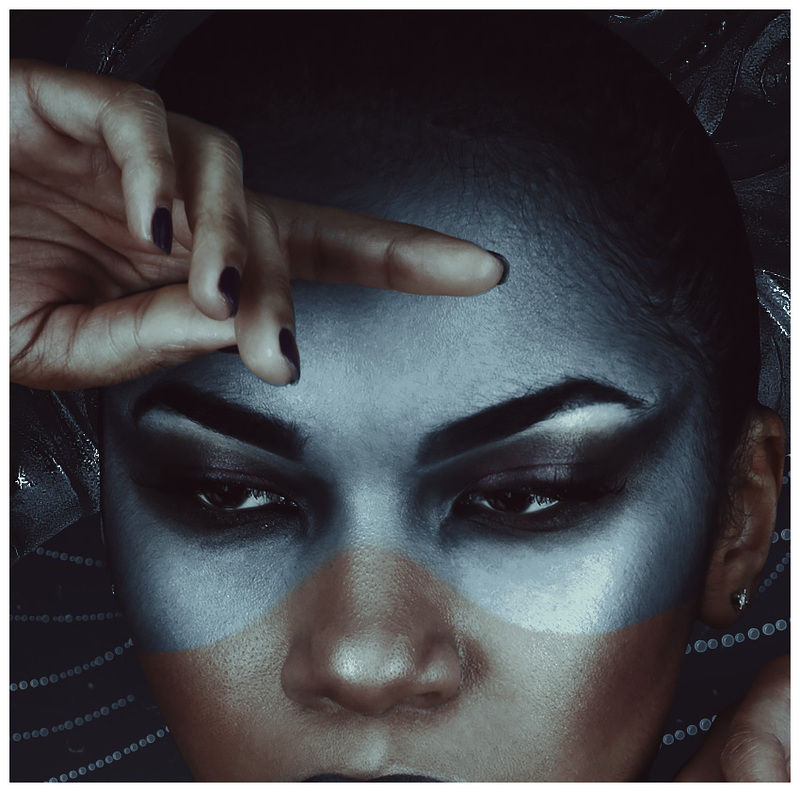 Copy the gradient map’s layer mask onto the Brightness/Contrast Layerto darken the lips. Now, let’s extract ourRound Wood Mirror Frame. Again, use your preferred method! I used the Magic Wand Tool since the image is on a nice, crisp, white background. Place the frame directly behind the subject. Group all of themain subject and frame layers together, naming it “Model”. We will be using this group to help make our shadows. Duplicate the “Model” group and Right-Click > Merge Group. Go to Image > Adjustments > Hue/Saturation. Settings: Lightness -100. Add some blur to the shadow by going to Filter > Blur > Gaussian Blur. Settings: 50 px. Move and morph the shadow up and to the left using the Warp Mode in the Free Transform Tool. Now on to the mood lighting! Usually, I would save this for the end, but the color change is so drastic in this image that I think it’s worth doing it sooner. Do note that this group of layers will always be above all other layers. All layers from here on out will be located under these five adjustment layers. 2. Color Lookup Layer: (3dLUT) Moonlight at 47% Opacity. 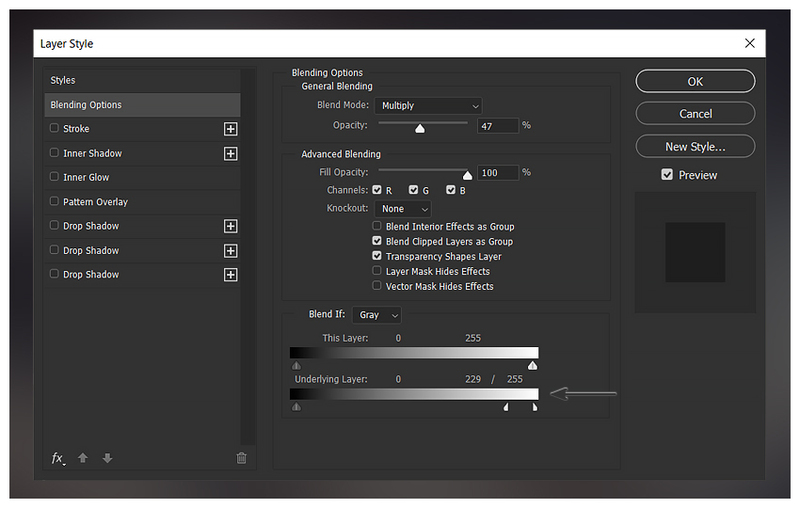 Blend If: Hold Alt to separate and move toggles. Now, there are plenty of premade spider-web brushes and textures; however, they are so fun to paint by hand! So we are going to create our very own brush from scratch. For the base of our brush, we will be creating a water droplet shape. Create a New 300 x 300 px Document.Make sure the background is white. Using the Ellipse Tool,create a black 45 x 45 px circle with an 80%Opacity and a 40% Fill. Create a New Layer above the circle. Using a small, soft round Brush, paint a crescent moon shape on the upper-left part of the circle. Merge the layers together and give the merged layer a very slight Filter > Blur > Gaussian Blur. Settings: Amount 1 px. That was just so our brush isn’t too sharp. Very few things in the world have a hard, crisp edge, so don’t be afraid to blur things a bit! Crop the canvas down so that it is the exact size of our droplet. Now that we have our brush made, we need to set up its settings. Open up the Brush panel and select our new brush. 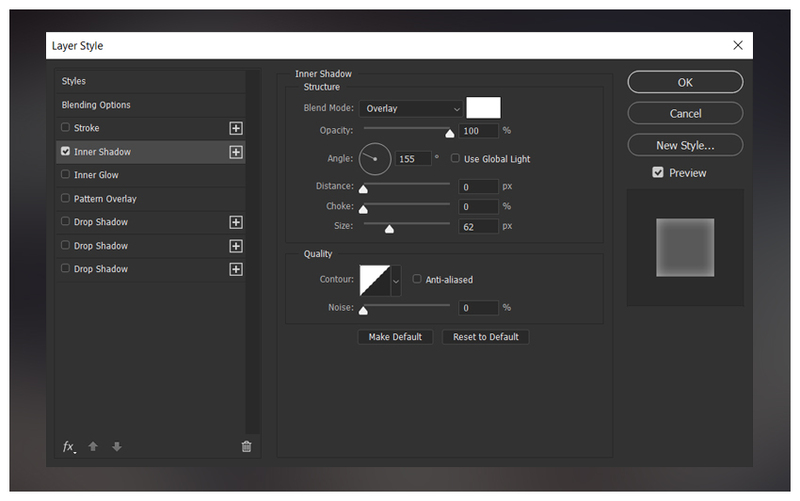 Hit the Create New Brush button in the lower right-hand corner of the Brush Settings panel in order to save a new brush with these settings. If we didn’t do this, we would have to redo the brush settings every time we selected this brush. Finally, we get to use our brush! Create a New Layer below our “Model” group. Select our new brush and set the Size to 15 px.However, keep in mind we will be changing the size as we paint our webs. Paint strands of white web in a swooping motion. If your lines are shaky, try increasing the brush’s Smoothing to 30–50%. This will help keep your lines steady. Just paint slowly if you are using a mouse. Make some strands slightly thicker than others, and use a large, soft round Brush to erase some of the edges of the strands to create a tapering effect. Create a New Layer and paint smaller webs towards the bottom of the subject and top of the frame. Make these strands less prominent than the ones around the head of the subject. Duplicate the web layers to increase their brightness. Just erase any part of the webs you don’t want to be brightened. Next, we will be designing an abstract version of spider eyes with the use of self-made beads and a nifty face-painting technique that can be used inmultiple differentways in any color you may need! 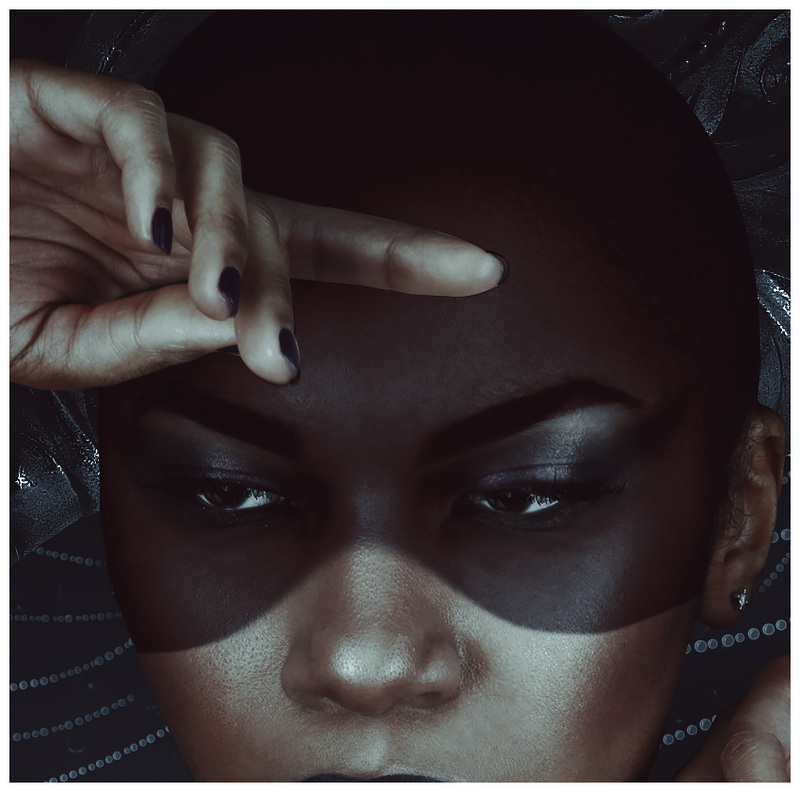 Hit Control-I to Invert the mask. Create a selection around the subject’s face similar to what you see below. I used the Pen Tool, but you can use whichever way you feel most comfortable with! Fill in the selection with white. 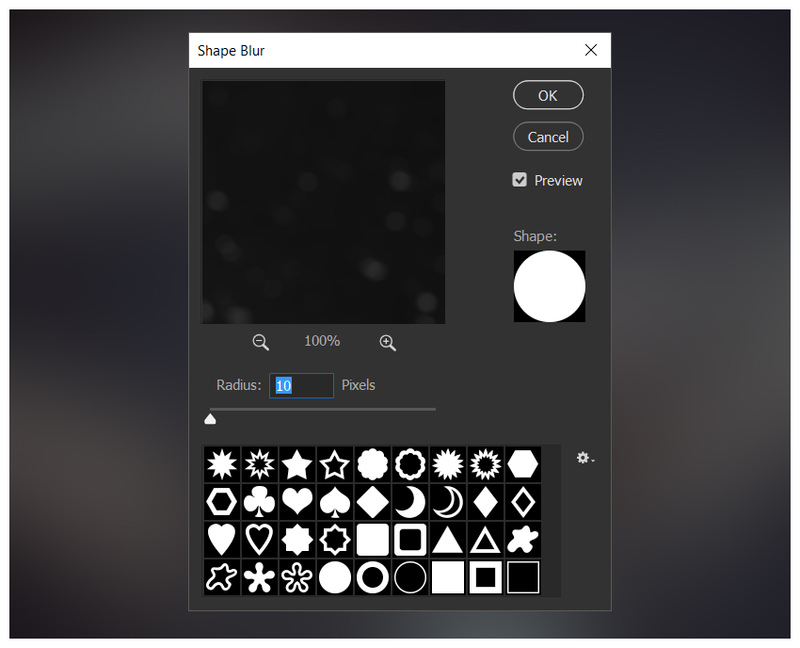 Create a Black to White Gradient Map and place it into the group. The group’s mask will act as a layer mask for all adjustment layers that are placed within it. 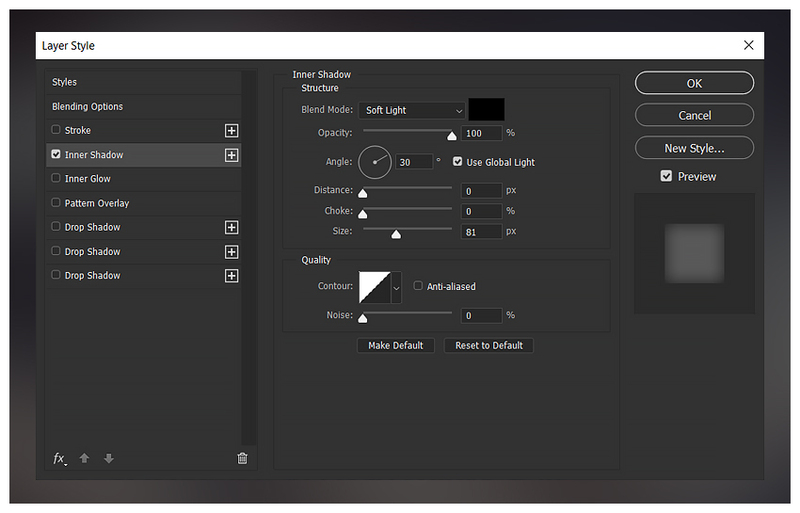 Create a Brightness/Contrast Layer, also placing it into the group, above the gradient map. Settings: Brightness -116 and Contrast 65. 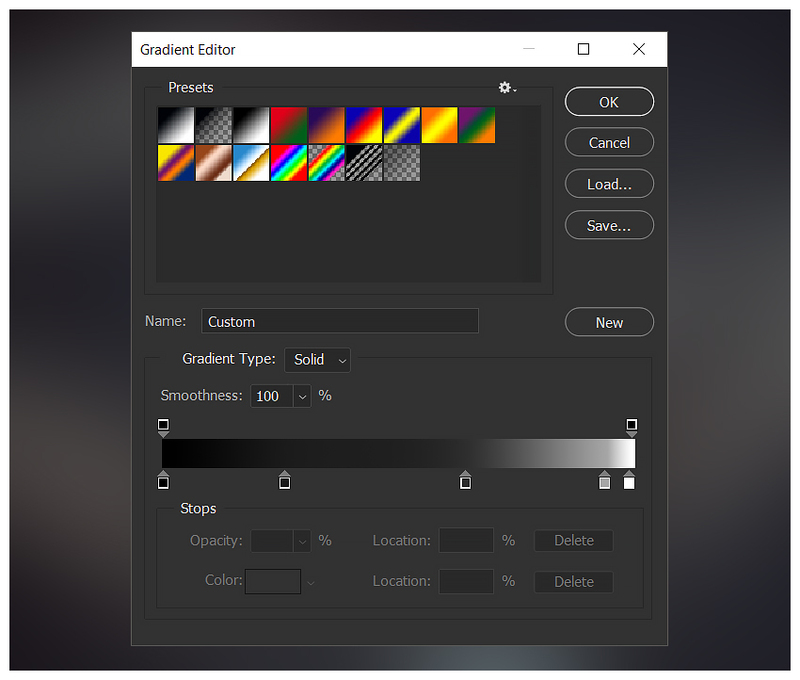 Create a Color Balance Layer, placing it aboveboth the B/C and gradient map layers. Settings: Red +46, Green -25, Blue -34. Using a soft round Brush,mask out the eyes, using the group mask. Now, we will be creating our “spider eye” beads. Create a black circle using the Ellipse Tool. Create a New Layer and clip it into the black circle. Using a small, soft round Brush with a 5% Flow, paint a white crescent moon shape onto the right side of the bead. Build up the white slowly and concentrate the white in the middle of the curve of the moon shape. Add a small white radial gradient shape, using a slightly bigger brush size, over the moon shape as well. Duplicate the black circle and smush it down horizontally, bringing it to the bottom of our bead. Bring the Opacity down to 30% to create the bead’s shadow. Duplicate the group and Right Click > Merge Group. Place the beads all over the upper face. You can do it similarly to how I have done it, or create your own pattern! Place beads behind our subject, onto the spider webs, as well. 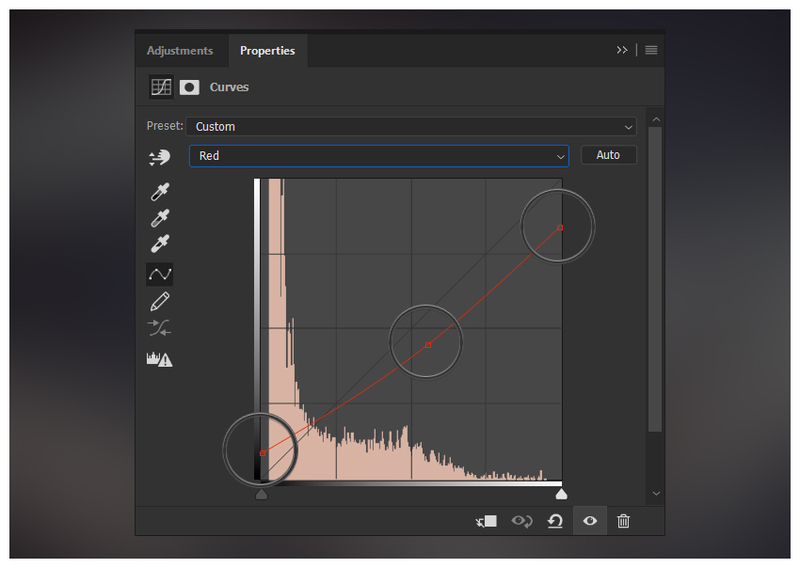 Create some highlights using either an Overlay Layer or aCurves Adjustment Layer. We are in the final stretch! We just have a couple more dust and web details to add, bringing her dark and dustyenvironment to life. Place another copy of the “07” texture from the dust texture pack right below our “CC” group, again flipping it vertically. Enlarge the texture so that the dust particles look closer and out of focus. Using the Line Tool,create a fewdiagonallines coming from the bottom-right corner of the canvas. Make them slightly random, not perfectly side by side. 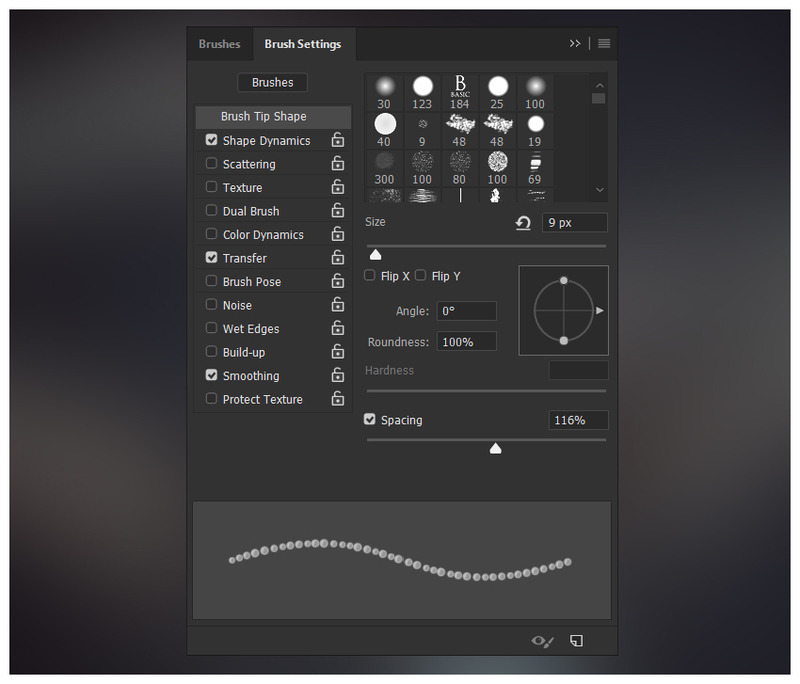 Add aFilter > Blur > Motion Blur. Settings:-72 Angle and85 Distance. This will give the lines a nice out-of-focus effect. Experiment with different blur filters! I tend to prefer a shape or motion blur to make objects look out of focus rather than a Gaussian blur, for instance. Sometimes making our own resources seems daunting, but it can be as easy as combining some simple shapes and stringing them together! Learning how to use basic tools, instead of solely relying on premade resources, gives you the ability to create without restriction. It’s not about how many resources you have, but instead how well you know your base set of tools with which you can create those resources yourself. And as always, share your art down below, along with any comments or questions!